which is sometimes referred to simply as The Blank. With it’s head modelled after his popular Skullhead design (read more here), this figure’s highlight was its innovative body, a highly articulated form that was still enough of a ‘blank slate’ for artists, including Gee himself, to build upon it. The true test of the shape’s usability arrived in mid-2016, when Gee partnered with the Clutter Magazine Gallery on The Blank Show, a curated exhibition of original art pieces created using The Blank as a base. A successful showcase, Gee continued to evolve and alter his design, introducing the more heavily detailed, robot-inspired RE:BLANK rendition in February of 2017. Once again partnering with the Beacon, NY-based gallery, Gee has selected a number of artists to once again test his design with the 2nd Annual Blank Show, challenging them to use either The Blank or the RE:BLANK as the basis for their original art pieces. Entering the exhibition space, the skull-laden King of Death work by Japanese artist Sayuru Ishiyama, also known as Tokyo Jesus, is prominently displayed. Utilizing The Blank figure as part of a larger diorama, it resides regally atop a realistic looking human skull sculpture, creating a beautiful contrast between the Skullhead‘s fantastical ‘skull & crossbones’ design and the morbidity of decayed, weathered bone. Fans of the band Iron Maiden will recognize the inspiration behind Jesse “JRYU” Yu‘s contribution, The Blank, which is derived from the cover art to the heavy metal act’s The Trooper single. Immaculately recreating the image using the Skullhead atop, Yu perfectly captured a sense of defiance in his piece’s stationary pose, the British flag paying tribute to Gee as well as Iron Maiden, both being of English origin. No longer worshipped by men, the Roman god of freshwater and the sea, Neptune, has sunken deep into the watery depths, his blue kingdom becoming his grave. Or, at least, that’s one interpretation of the intent behind Mike Strick‘s contribution, Neptune’s Ghost. Covered with barnacles, giving the erroneous illusion of Neptune having been sedentary, a rusted red-brown hue adorns his exterior as well as his trident, chains threatening to pull him back down to the icy deep he’s emerged from. And it is the inclusion of a watery diorama base that truly gives this sculpture life, creating the illusion of its fluid nature through wonderfully rendered texturing and coloration. The artist Wetworks (Carlo Andrada Cacho) used the RE:BLANK form’s head as a massive component within his Age of Decay diorama. Known for his assemblage art constructed out of model kit parts, this work’s focal point appears to be a female mechanic character that the artist built, a socket wrench grasped in her cybernetic hand, her statuesque stance emphasized by her metallic coloration with muddy patches. An apparently anachronistic creation, Soul Searching by JeAA (John Eugene Atendido Avila) has its Skullhead Blank adorned in samurai style armor while accompanied by a robot-like cube, one of Avila’s own ROBOX (2017) creations. But, if you look closer, the Skullhead has been altered, the teeth and nose removed, vent shafts adorning its cheeks, granting it the appearance of an inhuman automaton. Emblazoned with the kanji for “life” on its chest (生, “nama”), the crest of its helmet reads ロボX, which roughly translates in Japanese to “ROBOX”, the mechanical companion residing beside it. Based on the artist’s own photograph (pictured right), the ROBOX should be suspended within the Skullhead Blank‘s righthanded accessory, giving the impression that it has been captured or trapped, perhaps even implying that the Skullhead‘s search for a soul is now complete. A bit of a trite scenario on the surface, Don’t Cry Over Spilt Dreams by Boy in the Corner Studio (Heath Duntz) displays the RE:BLANK form sitting upon a specially sculpted throne, a partially finished food bowl and drinking decanter having fallen, spilling their contents upon the ground. A feat of construction, the artist having had to heavily modify the RE:BLANK form in subtle ways to allow it to sit in the throne, there is a certain humor to this overall design, the robotic character having no obvious need for the nurishment — or “spilt dreams” — depicted alongside it. Using a plethora of colors to create the illusion of a rainbow-hued array of paints oozing from her Icky Slicky piece’s head, artist Camilla d’Errico‘s contribution is more subtle than most but far from simple. With darker shades positioned to highlight the lighter tones, this melting aesthetic is one that d’Errico frequently employs, but the careful application within the deeply sunken eye sockets on this work make it a truly memorable example. Artist Ian Ziobrowski‘s works almost exclusively expand upon his fictional Nugglife setting, with this Bio Nugs contribution being no exception. Inspired by his own FP-420 (2014) piece, this new work is meant to be set “in the year 2420”, according to Ziobrowski, who refers to this time as “Nugglife’s dystopian future”. Creating a wasteland exterior to the piece, including several Dunny parts buried amidst the trash, the lit interior shows a resilient world, a clean waterfall feeding some bountifully green growth occurring underneath a northern lights effect in the sky. Titled Momento Mori after the medieval Latin Christian theory regarding the transient nature of all earthly goods and pursuits, Candie Bolton‘s piece has a dark glossy base coating infused with both sparkles and a color change powder. On top of this aspect, itself a reminder of the ever-shifting nature of life, Bolton finished her contribution with gilded embellishments, blooming flowers, and a single skull. In addition to the array of artists that Gee selected for this showcase, three more were chosen by him from online submissions intended to find fresh new talent. One such individual was El Hooligan, whose A.L.L. piece reimagined The Blank form into a space suit, it’s clear visor allowing a glance at the Eye of Providence inspired alien within. Being an aesthetic the artist is known for, having used the same technique on his 2015 Hecho en Mexico contributions as well as his Astronauts (2015) solo series, this rendition is particularly striking in the palpable texturing coating the body’s form. James Groman‘s Blank:Resurrected has the mechanical RE:BLANK decorated with a skeleton-like patterning, its bulging, bloodshot yellow eyes accentuated by purple crystals mounted near them. Holding a bone in one hand and a blaster rifle in the other, this piece is a disturbing interpretation of the killer robot concept, mutated to be part of Groman’s own universe by the Lazzuraxx Idol of Resurrection around its neck, a sculptural accessory that the artist first introduced in 2014 for his Rotten Rex (2013) pieces. The husband-and-wife duo of The Bots, Jenn & Tony Bot, use their signature style for their Death By Doughnuts piece, sculpting over the Skullhead Blank‘s shape with colored polymer clay. Giving crisp, suble texturing to the whole, their piece’s pink frosted donut element is brilliantly mirrored in its bone protrusions and wings, as well as the cartoonish drips emanating from its pitch black eyes. 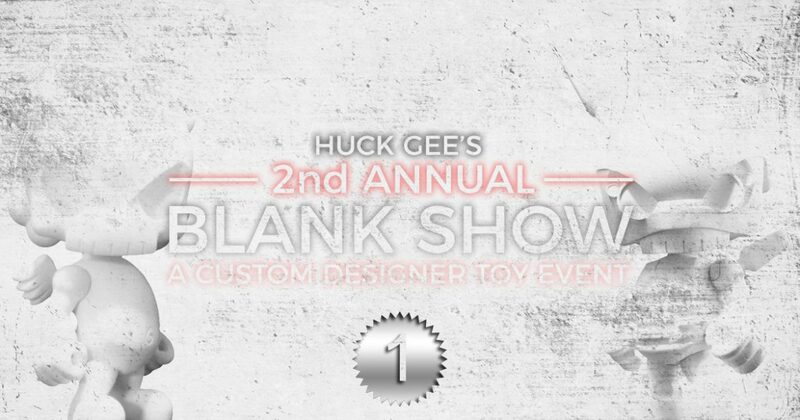 Continue on to Post 2 of 3 in the series “Huck Gee’s 2nd Annual Blank Show”. The 2nd Annual Blank Show group exhibition at Clutter Magazine Gallery had its opening reception on Saturday, July 8th from 6-9pm. All works in this exhibition will remain on display until August 4th, 2017 at the gallery’s physical location (163 Main Street, Beacon, NY 12508).